Jan. 30, 2019: The Bronco winter season is in full swing. For the indoor track and field teams and the boys’ swim team, the sectional championships are just around the corner. Based on their successes so far this winter, they should fare well. The track and field teams have had stellar performances in several major meets already this season, and this past Sunday they had a chance to compete in the Westchester County Championships. It is no small feat to win at counties, as 42 schools of all sizes compete against each other. On Sunday evening at The Armory, the Broncos had excellent results, with nine runners earning county titles either at the individual level or as part of a relay team. Eve Balseiro won three county titles; she placed first in the 300m (40.79) and was part of the winning 4x200m and 4x400m relay teams. The 4x400m relay (Betsy Marshall, Caroline Brashear, Sabrina Mellinghoff, and Balseiro) placed first in a time of 4:02.64. 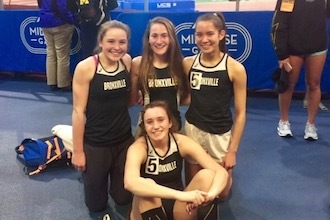 The 4x200m team, Caroline Ircha, S. Mellinghoff, Amelia Koenig, and Balseiro, not only won the 4x200m relay, but they also broke the Bronxville school record (1:44.86). In field events, Jules Gravier continued her success in the pole vault. She placed second with a nine-foot vault. Overall, it was a great meet for the Broncos. Fourteen girls broke personal records: S. Mellinghoff (55m), Alisa Kanganis (55m), Koenig (55m), Anna Saad (55m), Remi Mellinghoff (55m), Rory Denning (1000m), Marshall (600m), Andrea Shephard (600m), Emma Mandanas (3000m), and Molly Palma (1500m). For the boys, Matt and Alex Rizzo continued to make headlines with their success in long distance races. At counties, Matt won the 1600m (4:22.24) and brother Alex won the 1000m (2:29.20). The day before counties, the Rizzo brothers competed at the Sanders Invitational, a meet that includes some of the best high school runners in the country. Competing in the 1000m, Matt and Alex both broke the meet record; Matt placed second in a personal best time of 2:25.31, and Alex placed fourth, also setting a personal best time of 2:26.94. At counties, the boys’ 4x400m relay, A. Rizzo, M. Rizzo, Tommy O'Connell, and Zip Malley, placed second. Alex led the way with a 49.92 split, and the team finished the race in 3:32.42. Seamus Watters placed third in the 55m hurdles in a season best time of 7.91. The combined New Rochelle-Bronxville 200 medley relay team came in fourth at the Section 1 Conference 1 Championships last week. The relay team, Finn Seibold (Bronxville), Narmeri Franklyn (New Rochelle-NR), Matthew Pena (NR), and Tim Cushman (Bronxville), finished with a New York State Championship Meet qualifying time of 1:40.39. The 200 free relay team came in second, with a time of 1:31.87. Swimmers on the relay were Siebold, Miles Dower (NR), Jonathan Carsen (NR), and Cushman. Results for individual Bronxville swimmers are listed below. The Section 1 Championship meet will take place February 5 to 7. The basketball teams will host the annual Bronco Bonanza on Friday when the boys' and girls' teams face Keio in the main gym. The girls' game starts at 5:00 pm, and the boys' will follow at 6:45 pm. 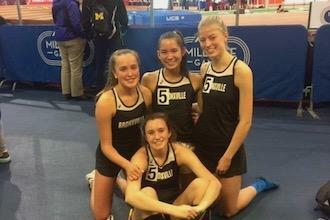 Pictured here: At top: Eve Balseiro (front) and (L to R) Betsy Marshall, Sabrina Mellinghoff, and Caroline Brashear won the county title in the 4x400m relay; in text: Eve Balseiro (front) and (L to R) Amelia Koenig, Caroline Ircha, and Sabrina Mellinghoff placed first in the 4x200m relay.